Image credit: Rabbit Hole Brewing. Continuing a tradition started in 2016, Rabbit Hole Brewing of Justin will again release a commercial batch of an award-winning brew from the country's largest single-site home brewing competition, the Bluebonnet Brew-Off. Skroob's Black Lager (4.53% ABV) is a German-style schwarzbier with a name that references Spaceballs, and a well-known line from the film, "May the Schwartz be with you." Featuring hints of chocolate and dark roasted malt, the beer is based off a recipe created by Robert Brown, who competed in the 2017 edition of the Bluebonnet as a member of the Houston-based Foam Rangers Homebrew Club. In terms of awards, Brown's creation won gold in the Dark European Lager category during last year's competition, while also ranking third for Best of Show. As for Brown himself, he has taken his talents overseas, and is now the head brewer at 7 Bridges Brewing Co. in Viet Nam. 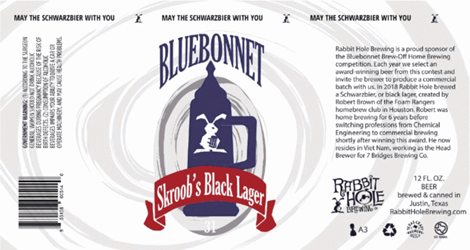 It'll be here in North Texas, though, where Skroob's Black Lager will make its debut, tapping first at the 2018 Bluebonnet. Now in its 32nd year, the event will take place Friday and Saturday, March 23-24, at the Sheraton DFW Airport Hotel. From there, the beer will be distributed in limited quantities, being made available on tap and in six-packs of 12-ounce cans.